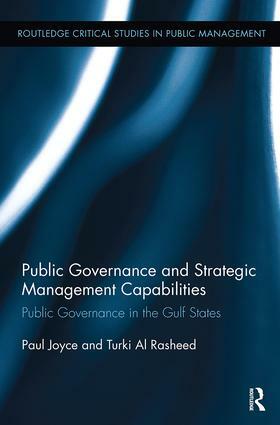 This is a book about the modernization of public governance and the development of strategic states. It focuses on six Gulf countries (United Arab Emirates, Oman, Qatar, Bahrain, Saudi Arabia and Kuwait) and presents research findings from quantitative data analysis and comparative analysis of the trends and developments of the six Gulf states. The book analyses the workings of the governments of the Gulf States, including the way that they have tackled national development since the mid 1990s. This includes how their strategies for economic diversification have been reflected in trends in revenues from "oil rents" and whether they are still rentier states or not. Evidence is presented on key topics such as government strategies and long-term strategic visions. Careful consideration is given to reputational evidence and to the strategic process capabilities of the governments: integration and coordination of government machinery, mobilizing public and private stakeholders, evaluating, and adapting – all defined as strategic process capabilities. This examination of government is also used to study their performance in strategic results areas: the economy, the natural environment, and the happiness of their citizens. The countries emerge from this analysis as far from identical in terms of capabilities or in term of performance. Paul Joyce is Visiting Professor at Leeds Beckett University, UK, an Affiliated Researcher in the Department of Public Management at the Solvay Brussels School of Economics and Management, Belgium and an Associate at the Institute of Local Government Studies, University of Birmingham, UK. Turki Faisal Al Rasheed is Visiting Professor at the Department of Agriculture and Bio-systems Engineering, College of Agriculture and Life Sciences, University of Arizona, USA and a Visiting Research Fellow at Liverpool John Moores University, UK.